Hello again nail geeks! Continuing on with this week’s amazing Black Friday posts, I bring you the annual epic box from Baroness X! If you’re new to the brand, every year for black Friday the brand creates a themed box loaded with goodies. The entire box is a mystery, except the polishes. The last two years of boxes were absolutely incredible for the goodies inside and I’m positive this year will be no different! If you’re like me and have been stalking for some teasers for the extras, it seems like there will feature some bath and body goods, and maybe even something from the sister brand Demiflux (which specializes in jewelry and other crafty pretties) of course this is my speculation, but regardless there will be badassery ahead. Now, the polishes in this box include a topper, an OG unicorn pee polish, and two ultra shifty magnetic polishes. I encourage you to check out my video of these: you’ll see all the movement and a thorough look at how the magnetics look alone, over an undie, and on their own. 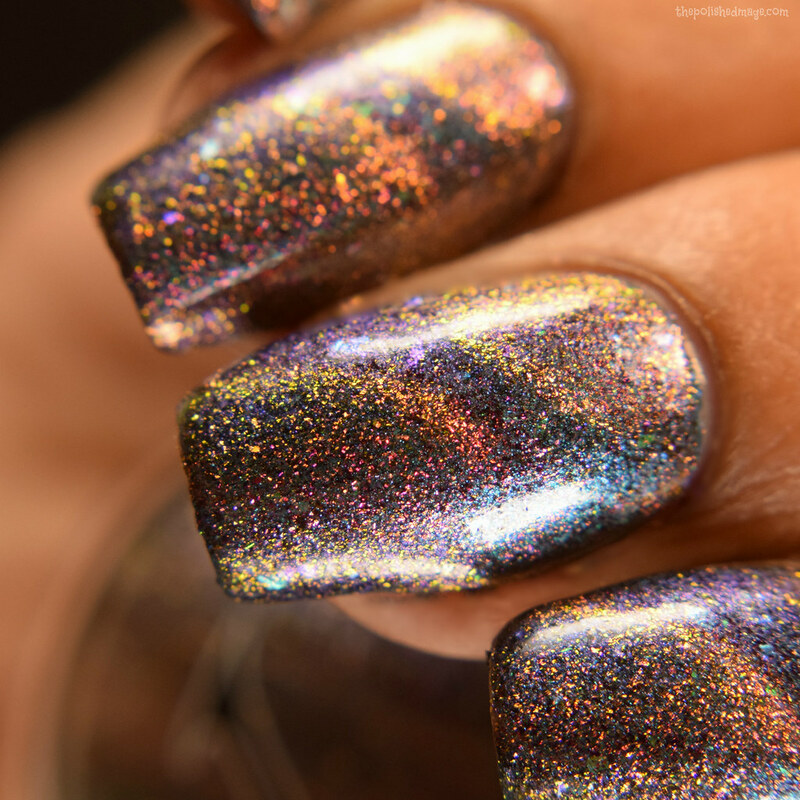 Dawn of the Wind (flakie magnetic) – magnetic teal/blue/purple flakies, magenta/copper/gold/green aurora pigment and a touch of holo flakies. Swatches show two coats over a dark teal cream. Under normal circumstances, I’d say you will use one coat over an undie and you’ll be good to go. I did two here since I recorded my video right before swatching. Formula has a rich jelly feel and I can safely say you are able to wear it alone at three coats. Now, keep in mind both magnetics in this box are intended for being used as a topper, but your girl is super extra and did all the things for the video. No texture after topcoating, and this sucker is SHIFTY. My hubs was even impressed, ya’ll. 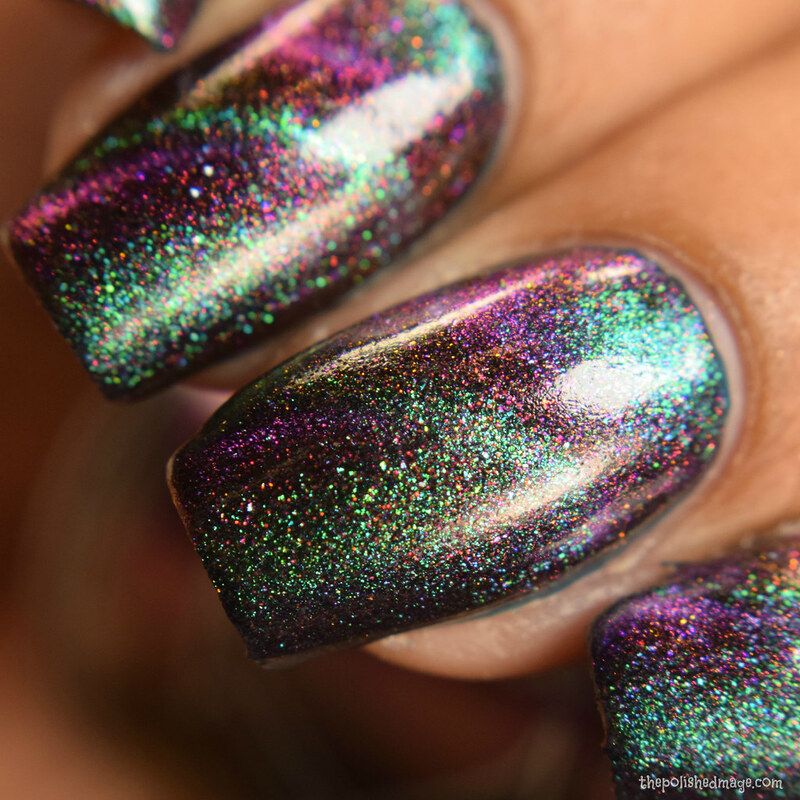 You will see purples, blues and greens on the magnetic pigments against a blackened base loaded with strong red shimmer. Seriously, you need to experience this in person. 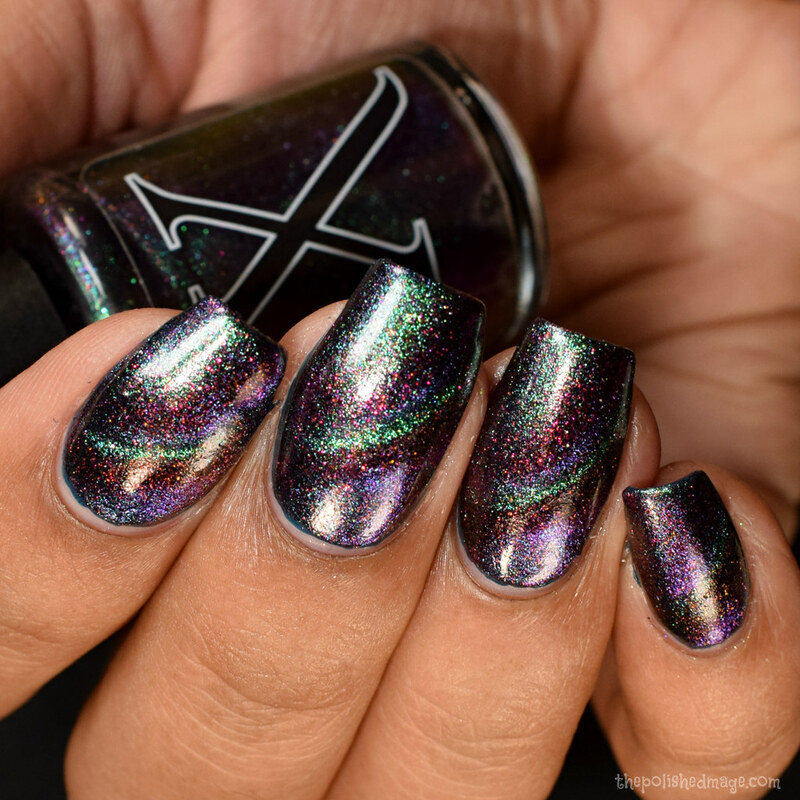 Celestial Warriors (flakie magnetic) – magnetic magenta/copper/gold/green flakies, teal green to blue to purple shifting pigment and green to blue to purple iridescent flakies. 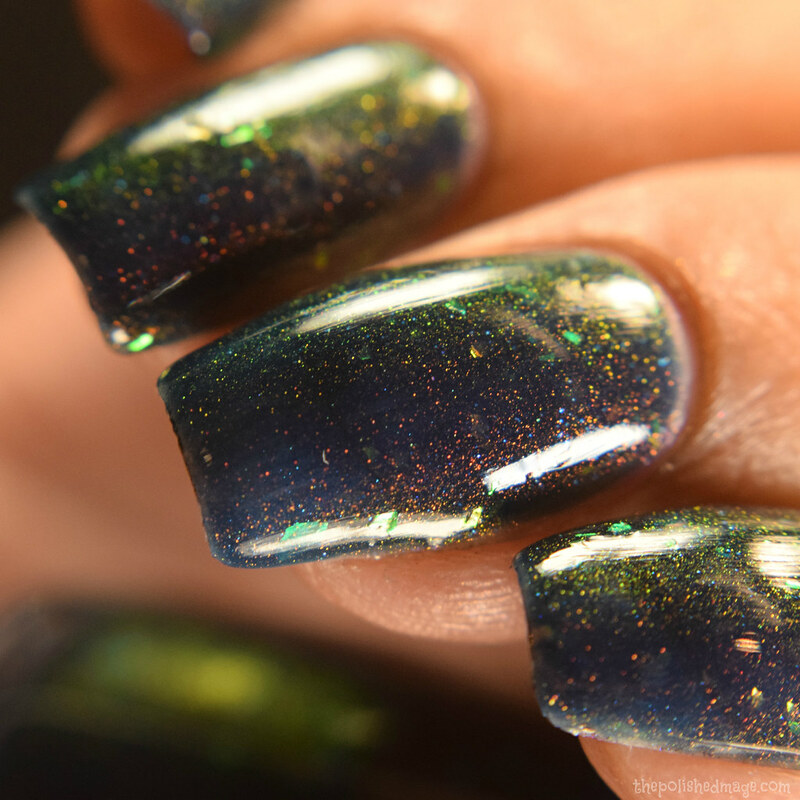 Swatches show two coats over a dark teal undie. Same as Dawn of the Wind, this is intended as a topper and should be worn with one coat over an undie. I did test this one for alone wear too, and I think it will be more flattering as a topper HOWEVER, still looks really cool on it’s own too (watch the video). The background is a minty green and the magnetic pigments are a strong shift through pinks, golds, greens, and coppers. This is CRAZY. I had no problems with the formula, its a touch squishier than Dawn, and there was no texture here either after topcoating. My camera seriously freaked out on the macro shots but trust me in person, there is a defined magnetic line. (I’m using an arc magnet from Lantern and Wren in both). Swatches show three coats with topcoat. Formula has a super squishy feel and feels on the lighter side, though I got full opacity at three coats (a touch of smile line is seen in these pics due to the very bright lights in my light box). The unicorn pee stands out strong again the navy base, and appears in it’s red state with a strong green shift on tilt. The little flakies picked up easily for me and laid down flat. No texture after topcoat. 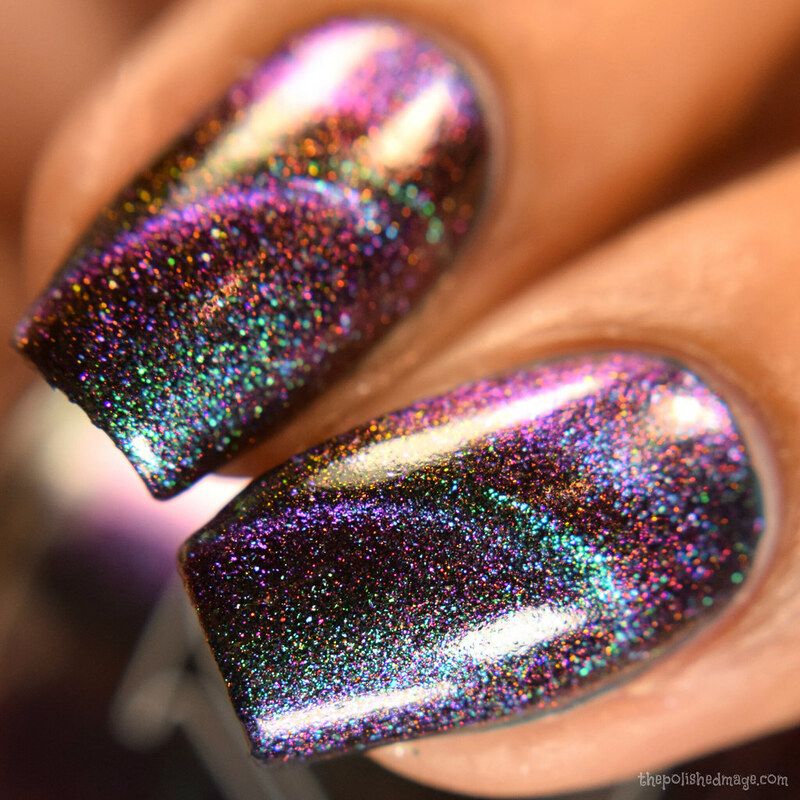 I’d like to point out that the brand’s topcoat is perfect for jelly polishes like this in that it is thinner, and really helps against shrinking from the jelly. I wrapped my tips well with it, and had very minimal shrinkage. There will also be a shipping discount! Baroness X has lots of stuff that can get a little heavy for shipping but this weekend the maximum amount for domestic shipping will be $5 (current max is 10). The box is included in this so take advantage! (And add some of the whipped soap and lotion too YUM.) There are some fantastic swatches from other amazing ladies over in the Facebook fan group too so get in there if you’re not there already and your girl will get you in!